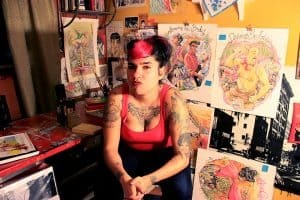 Cristy C. Road is a Cuban-American artist, writer, and musician who’s been supplying creativity for punk rock, publishing, and social justice movements since she was a teenager in Miami, circa 1997. Road self-published Green’zine for 10 years, and has since released three illustrated novels which tackle gender, sexuality, mental health, and cultural identity (with a tinge of bathroom humor and curse words): Indestructible (2005), Bad Habits (2008) and her most recent work, Spit and Passion (2013), a graphic queer-coming-out memoir (about staying in the closet and listening to Green Day). C. Road’s work has been featured in the Baby Remember My Name: New Queer Girl Writing Anthology, Live Through This Anthology, Maximumrocknroll, Razorcake, New York Magazine, The Advocate, The Progressive, and countless other published works. As a musician, Road fronted The Homewreckers for eight years, and continues to perform and write music. She’s toured nationally and internationally on her own, and with Sister Spit: The Next Generation. She is currently illustrating the NEXT WORLD TAROT Card Deck and writing pop-punk songs in Brooklyn, NY.